Julian Assange to speak at ‘MODERN WARFARE EXPOSED’ 6th April. Other speakers include Ian Cobain, Chris Cole and Ben Griffin. PLUS listing of other ‘anti-drones’ events through April. JULIAN ASSANGE (Founding Editor of WikiLeaks) will join a variety of other speakers via video link for an afternoon focused on broadening our understanding of how the face of warfare has been dramatically and covertly changed and what this means for our world today. Warfare and the military industrial complex is at the heart of many WikiLeaks’ releases. The huge cache of documents passed to WikiLeaks from Bradley Manning included both the Afghan War Diary and the Iraq War Logs as well as the Collateral Murder video, and the State Dept Cables included revelations about US drone warfare in Yemen, something not officially acknowledged as occurring at all. Through WikiLeaks how and why warfare is conducted by people in power is increasingly exposed for analysis and there are few people better placed than Julian Assange to interpret this for us. Julian Assange joins five other speakers, each of whom, like him, bring important individual perspectives and experience to the subject. Ian Cobain is an award winning investigative reporter, currently a senior reporter with the Guardian (see this article on rendition and this latest on British involvement in human rights abuses in Iraq), whose extensively researched book ‘Cruel Brittania’, a secret history of torture, was published last November. Chris Cole is the founding editor of the authoritative UK drones watchdog Drone Wars UK – a site well worth checking out for both background information on drones and ongoing posts on British involvement in Drone warfare. In this article published in the guardian in 2011, he explains why drones, which we often connect mainly with US policy, are a matter of concern for us here as well. Ben Griffin founded Veterans for Peace after a personal journey of several years from career soldier to pacifist. He served in the conflict zones of N.Ireland, Afghanistan and Iraq, and his first act of conscientious objection was refusing to return to Iraq to fight under United States’ command. You can listen to him talking about this process here at 0.20.30 and 50.40. (or go to this on you tube). Ben served in the SAS and is therefore able to address the subject of Special Forces warfare from the perspective of his own personal involvement. Ian Cobain’s latest article on British involvement in human rights abuses (mentioned above) concludes in referencing Ben’s experience of exposing this involvement and the reaction of the MoD to this exposure. Michael Lyons was a medic in the navy when he was alerted to the truth about the war in Afghanistan through the material Bradley Manning had released to be published by WikiLeaks. Being horrified by what he discovered through this and by what was further being revealed in the training he was receiving for deployment to Afghanistan, he became a conscientious objector and said that he would not go to Afghanistan. On one particular day he was ordered to do rifle training, refused and eventually served 9 months in prison for disobeying this order. He is a member of Veterans for Peace. You can read about Michael on this blog here and at VfP here and hear Ben Griffin talk about him here at 1.06.58. Adnan Sarwar is a member of Veterans for Peace who served in Iraq in the Royal Engineers. He has just written a book about his experience of going to war. You can hear him in this video here at 00.50 where he speaks briefly about his involvement in warfare and how he first encountered VfP. This article – What are Drones? – from Jan 2010 by Chris Cole and Jim Wright is probably still the best starter on the subject of drones as a whole. The following video from Jeremy Scahill is a good primer on the history (still fairly recent) of the use of drones in the US up to last summer. The United States is on a new trajectory in warfare, says Jeremy Scahill, national security correspondent for The Nation. With its increase in drone strikes, the United States is turning away from the large-scale military interventions of the past decade and towards covert operations, beyond such known locations as Pakistan and Yemen. Check out this video to learn where else Scahill thinks these covert ops are headed. Special Forces warfare is also the subject of ‘Dirty Wars’, a film researched by Jeremy Scahill in which the warfare is conveyed from the vantage point of the victims and their surviving family and friends. This will be shown at the Frontline Club on 14th April and it sounds as though seeing the film would be an excellent follow on from ‘Modern Warfare Exposed.’Glenn Greenwald talks about the film here in a short article, itself highly relevant to the subject. In a Guardian article titled Anti-drones activists plan month of protest over Obama’s ‘kill’ policy, Paul Taylor writes about April being a callout month for people in the US to engage in actions against drone warfare. You could begin by joining the protest called by Veterans for Peace in London in conjunction with their San Diego (US) counterparts, for Thursday 4th April. General Atomics manufacture the Reaper Drone. Please see more information/contact etc here. For more info pls see this post above and here. This article by Jerome Taylor writing in the Independent last November gives some background. 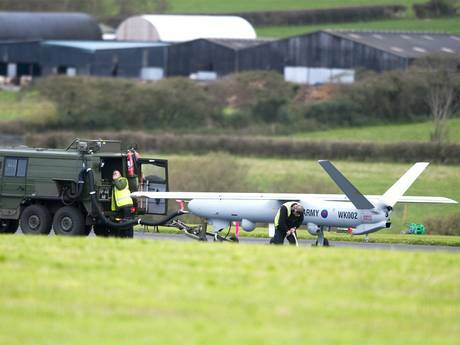 The small seaside town of Aberporth, nestled on the clifftops in Ceredigion on the west coast of Wales, is the headquarters for Britain’s drone development programme. For more information please see also here and here. 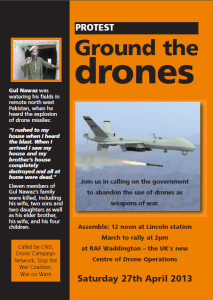 A public meeting jointly called by Afghanistan Withdrawal Group of MPs and the All Party Drones Group, with speakers Chris Cole (Drone Campaign Network UK) and Rafeef Ziadah (War on Want). More information at cnd uk here. Medea Benjamin, a founder of CodePink and Global Exchange and inveterate anti drones protester will be giving a talk based on her book Drone Warfare as part of the Festival of Ideas, in Foyles in Bristol. 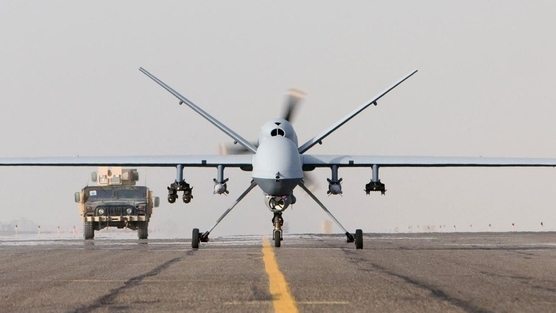 Medea Benjamin provides the first extensive analysis of who is producing the drones, where they are being used, who pilots these unmanned planes, and what are the legal and moral implications. Remotely controlled unmanned drones have become the latest way to wage war and thousands have been killed in drone strikes from Afghanistan to Yemen, from Pakistan to Gaza. There is now an ongoing ‘Terror Tuesday’ campaign. This is a response to the now infamous New York Times article (which horrifically is based on information ‘leaked’ from Washington that is widely acknowledged to have been intended to ENHANCE Pres Obama’s reputation – what can you say?). This campaign is known as Counter Terror Tuesdays and the idea is that every Tuesday whilst the president is in discussion choosing whom he will designate for death, citizens are phoning in to protest this. You can use the guidelines at War is a Crime or call the US Embassy 0207 499 9000. And finally, although this relates to US drone strikes, take a look at ‘Out of sight; out of mind’; an extraordinarily affecting graphic visualising US drone strikes on Pakistan since 2004, giving casualties under the headings of ‘children’, ‘civilians’, ‘high-profile’, ‘other’. 1 Response to Julian Assange to speak at ‘MODERN WARFARE EXPOSED’ 6th April. Other speakers include Ian Cobain, Chris Cole and Ben Griffin. PLUS listing of other ‘anti-drones’ events through April. Good luck in September election, Julian.